Receive this HUGE collab when you sign up for our Newsletter. 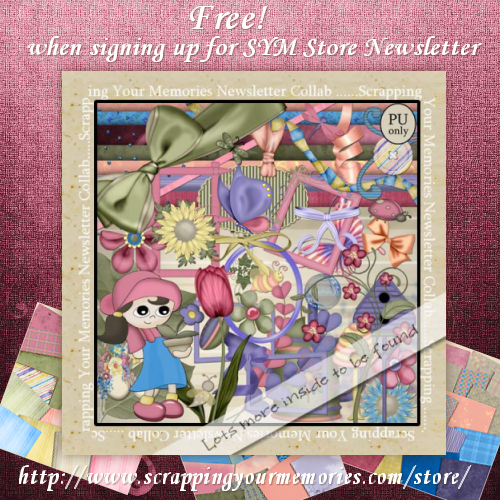 Coupon code will be place in the newsletters through the Month of May 2011, so current and NEW subscribers will be able to download this kit for Free. The kit is Huge! Over 140 Elements following the same color palette. The preview only shows SOME of the items you will be receiving! The kit includes: Tons of different types of flowers, beautiful bows, ribbons, frames, mushrooms, fences, butterflies, bumble bees and beehive, Frog, rose petals, buttons, tags, glitter, word art, hearts, Ice cream cone, moon, little chick, lamp, paddle, flip flops, Turtle, adorable posers including 2 cute bunny posers, dove, watering cans, birdhouses, flamingo, dragonflies, branch, bracket, candle, spring binder, eggs, 1 awesome Gel Alpha, 60 papers and more! The designers who contributed: Dels PSP Emporium, EmJayScraps, Puddicat Creations, Graphics By PokaDot, MeOhMy, PSP Girl, Stacey Designs, Shellez Creations, TLP Designz, JosDZigns, Moon Gazer Designs, Scrap Stuff by Shawna, Michelle Angels, Kreations By Sparky.